Carcassone is an excellent port of an ever-popular board game. The game itself is pretty much identical to the board game. 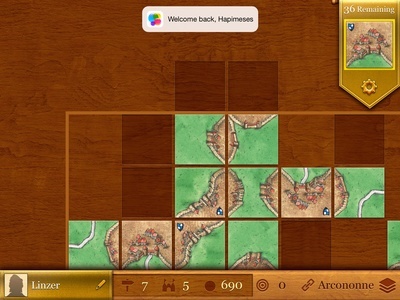 You can play online, locally (pass the pad), or with the AI, and the goal is to score as many points as possible by using your meeples to claim castles, roads, and fields on randomly-drawn tiles. 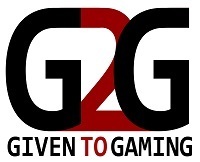 Although it isn’t free to play, it is worth the cost. All of the modes of play are well-executed, so you can get a lot of value out of it. A particular bug-bear of mine in board game ports is the quality of the AI. 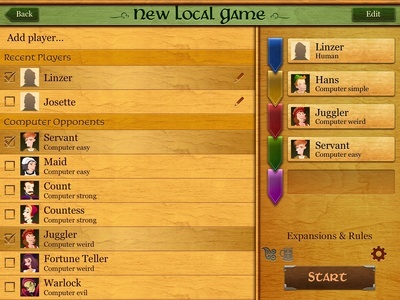 In Carcasonne, you can pick from different types of players, who adopt different strategies. This means that even if your main mode of play is offline, there’s still a challenge to be had from the other players. Likewise, the ui is clean and simple, and I love the music, which adds character to the game. 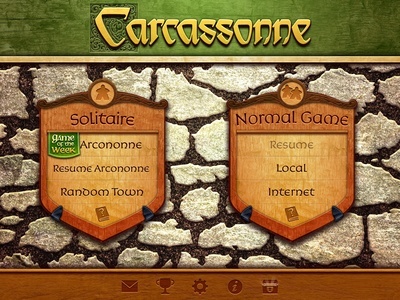 Carcassonne also has a solitaire mode, in which you have to build progressively larger towns and roads starting at 1 and going all the way up to 6. 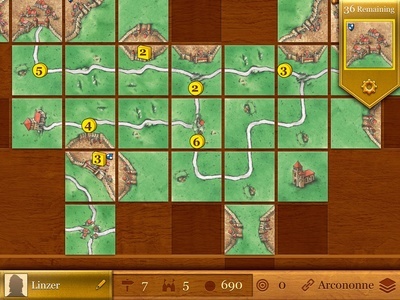 As you lay tiles, points are deducted from your total, and the aim is to finish your roads and towns in the fewest tiles possible. There’s a new set of tiles to do this with every week, so you can challenge yourself to beat your high score. You can also pick other sets and do the same. It’s a mode unique to the app, and it does add extra interest. There are additional expansions that you can purchase in-app. As you can pick which ones to turn on, this is a good way to add variety to the game. I do like the app, particularly its aesthetics, and it’s great for when you don’t have the time or space to play the table-top version.